An excellent treatment for a visible boost, The skin will literally glow from the intense hydration. 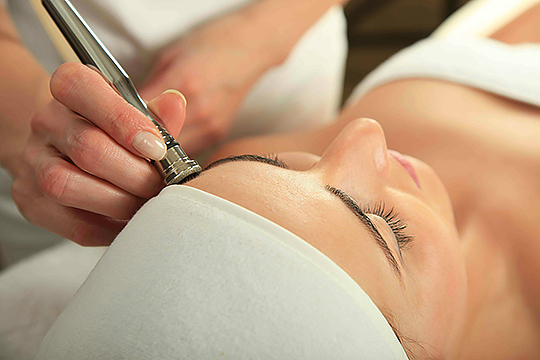 Microdermabrasion use a minimally abrasive instrument to gently sand your skin, removing the thicker, uneven outer layer. This type of skin rejuvenation is used to treat light scarring, discoloration, sun damage and stretch marks, removing the top most layer of dead skin cells in order to allow newer skin cells to the surface. It helps to thicken your collagen, which results in a younger looking complexion. Collagen is a protein in your skin that’s abundant when you’re a child and makes skin appear taut and smooth. Collagen production declines as we age, resulting in looser, uneven skin. Come and experience our Weston signature Day Spa package that include a Deep facial with a microdermabrasion and you can even add an IPL or LED light treatment for a younger and perfect skin. Lorei Medical Spa, your best choice for all your skin care treatments.